Germany-Netherlands soccer match in Hannover canceled. 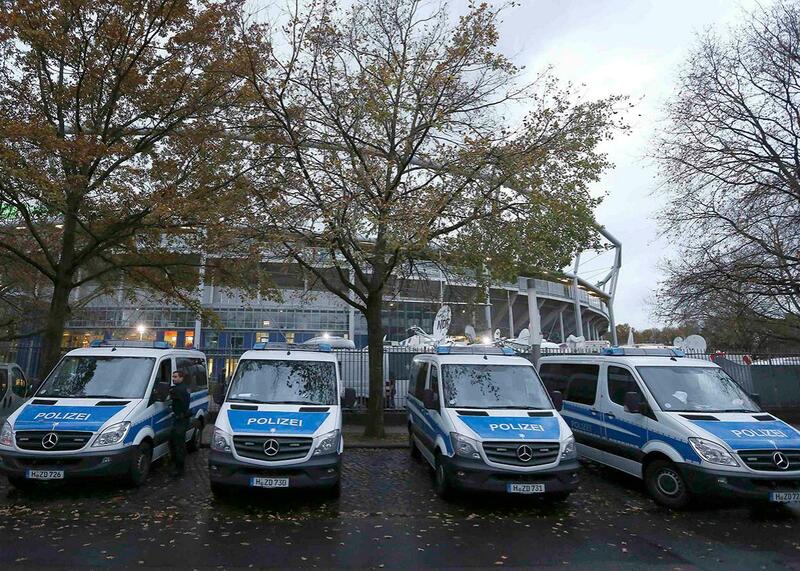 Police cars stands next to the stadium before the Germany–Netherlands match at HDI Arena in Hanover, Germany. Photo by Morris Mac Matzen/Reuters. Update, Nov. 17, 5:00 p.m.: Reuters is reporting that German officials had not found any explosives or made any arrests in what was beginning more and more to look like a bomb scare that forced the cancellation of Germany’s game against Netherlands..
“There have been no arrests so far. As for the question whether explosives were found, I can tell you that as for now, no,” Lower Saxony interior minister Boris Pistorius said during a news conference in Hannover. Original post, Nov. 17, 2:16 p.m.: Germany’s Hannover stadium was evacuated and the international friendly match between Germany and the Netherlands was canceled on Tuesday after “concrete information” emerged about an apparent bomb plot, local media reported. “We have concrete information that someone in the stadium wanted to set off an explosion,” the president of Hannover’s police force Volker Kluwe told local media, adding that there was a bomb attack planned for the game. There was a suspicious object discovered about an hour before the game, German media reported. Germany was playing France at the Stade de France on Friday when terrorists attempted to target the match as part of a wider attack on Paris, but at least one was reportedly turned away at the gate. The attackers ended up blowing themselves up outside and near the stadium instead, killing two. As Deadspin reported on Monday, the decision not to evacuate the stadium in that game may have saved many lives. The HDI Arena in Hannover has a capacity of about 49,000 people. Chancellor Angela Merkel and other top German officials were set to attend the game on Tuesday, the Associated Press reports, in order to demonstrate they would not bow to terrorism.